What is competency based interviewing and what should I expect in the interview? Behavioural or competency based interviews are a style of interviewing used by organisations in order that a candidate can best show how they would demonstrate certain behaviours/skills in the workplace; by answering questions about how you have reacted to and dealt with previous work place situations. The idea being that by looking at past experience a potential employer can predict future behaviour. A competency is something that can be measured and is now commonly used, not only in interviews and through other aspects of the assessment process but also in appraisals and training. During the interview itself you will be asked to give an example of a situation or task that led you to take a certain course of action. The interview questions maybe slightly different to the style you may be used to. They will tend to focus on past situations and your behaviour in those situations. "Please give me an example of when. .” or "Tell me about an occasion..." etc. Give a real example that actually happened to you - don't talk in broad terms about how you generally tackle those sorts of situations. Talk about a specific example. Be specific, not general or vague. When answering, remember that the interviewer wants to know what YOU as an individual delivered and achieved, so avoid over-using examples of ‘we’. Once you have talked about your example, the interviewer will probably ask you further probing questions to get a deeper understanding of what you did. Be ready to talk about your example in a lot of detail. 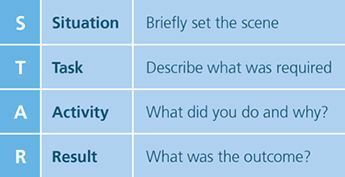 These probing questions will then be used to determine the course of action you took and what changes were created by those actions and the effects of those actions on others (which is key to remember when discussing your answer). Don't describe how you would behave. Describe how you did actually behave. If you later decided you should have behaved differently, explain this. The employer will see that you learned something from experience. When answering competency style questions it is best to adopt the STAR model, which will allow you to structure your answer in a logical and concise manner. Task – what did you have to do? Action – what action did you take and why. Were there any challenges/obstacles and how did you overcome them? Describe the Situation and the Task briefly. Most of your answers should focus on Action and Results; applying the who (you), what, when, where, why and how model often used in journalism to answer all the relevant questions that will keep you focused and make your description more interesting. The best way to identify what competencies the organisation is likely to require is to review the job description and discuss this further with your Consultant who will be able to advise you. For each competency being measured try to think of specific examples of when you have evidenced those behaviours but do not prepare specific answers prior to your interview as this is likely to mean that you provide answers that do not fully answer the question. A common mistake made is for the candidate/interviewee to prepare so rigidly that they are only prepared for one specific question per competency; the mistake being that the question prepared for is not the question asked. It is obviously important that you listen to the question put to you and answer it rather than one that you guessed might be asked. You may find it helpful to run through some competency examples with a friend or colleague prior to your interview. • Describe a time when you were faced with problems or stresses at work that tested your coping skills. What did you do? • Give an example of a time when you had to be relatively quick in coming to a decision. • Give me an example of an important goal you had to set and tell me about your progress in reaching that goal. • Describe the most creative work-related project you have completed. • Give me an example of a problem you faced at work, and tell me how you solved it.